Question: What do you get when you cross a Scandinavian with an Inuit (commonly known as an Eskimo)? Answer: A Greenlander. 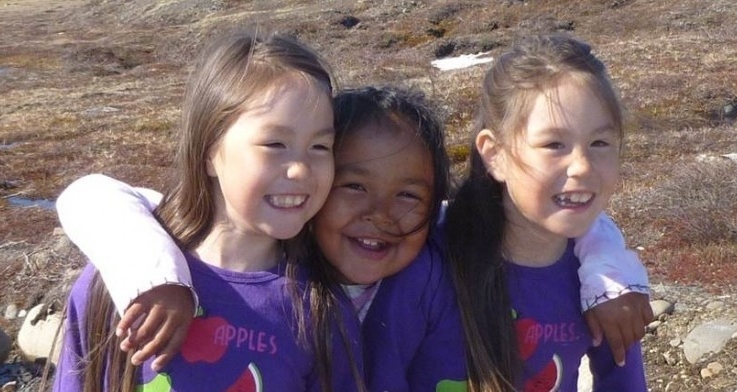 And in the case of these three little girls, adorable Greenlanders. The world’s largest island, most of which is north of the Arctic Circle, is home to one of the most fascinating cultures – and physically intriguing people – I’ve ever seen. The Inuit people have lived in Greenland — known in the local language as Kalaallit Nunaat — on and off for the past 4,000 years, surviving on hunting and fishing. Scandinavians started arriving at the end of the 10th century. Greenland became a Danish colony in 1814 and still belongs to the Kingdom of Denmark, although it now enjoys almost complete autonomy. Most people are ethnically mixed and bilingual, speaking both Danish and Greenlandic. 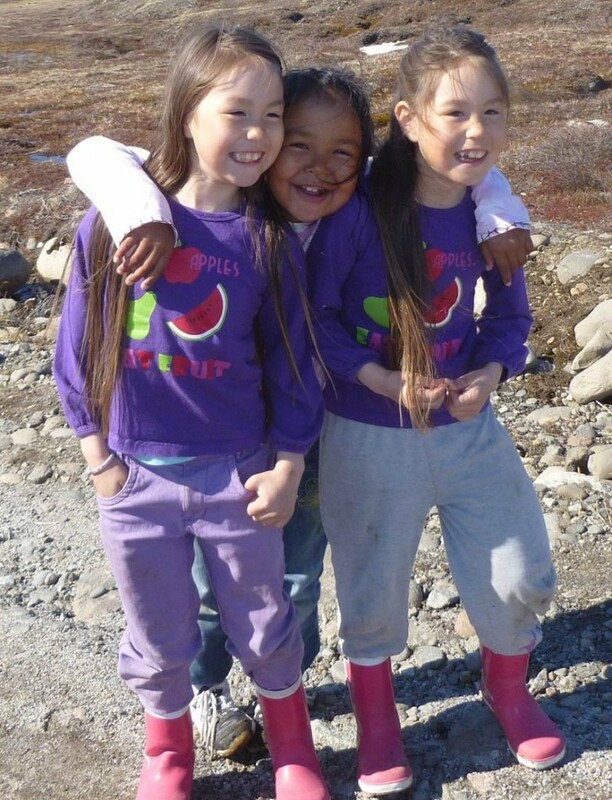 I encountered these young ladies near the town of Qeqertarsuaq (say that 10 times really fast!). I was on a guided hike through a valley watching humpback whales feeding in the harbor when I noticed a group of children. I learned they were from a nearby elementary school on a nature walk. They didn’t speak English, but with my keen sense of observation, I was able to discern that the two girls on the end were identical twins. The girl in the middle was apparently their BFF. The weather that June day in the Arctic was unseasonably warm. But it wasn’t as warm as the smiles on the faces of these captivating children. I admit it – I’m not a dog-lover. 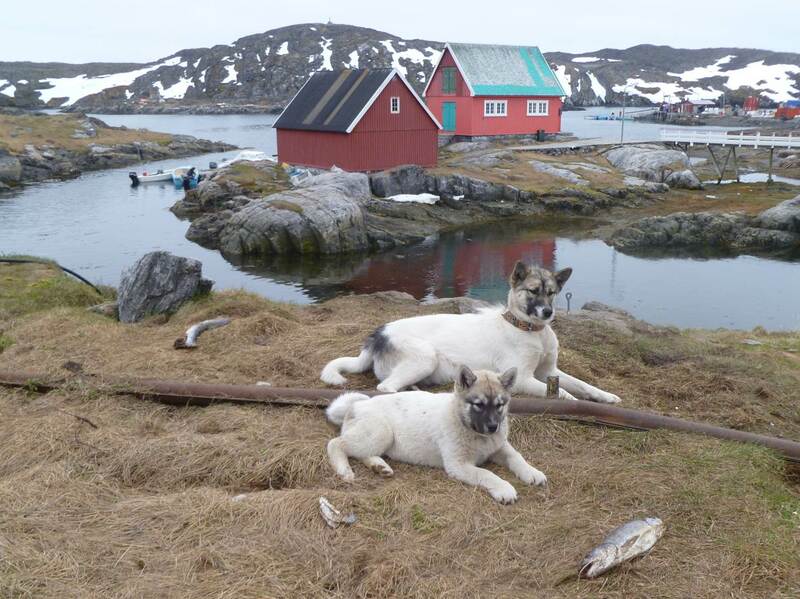 But I found these Greenland Huskies to be among the most alluring animals I’ve ever seen. 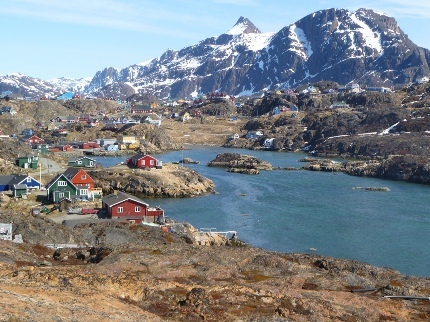 This photo was taken in Itilleq, Greenland, a village of about 100 people a few hundred yards north of the Arctic Circle. In some of these towns in this sparsely populated country, it’s not uncommon for dogs to outnumber people. As much as I wanted to pet these adorable creatures, we were warned not to go near them. In Greenland, Huskies are working dogs, not pets. They do not possess a docile temperament and Greenlanders normally don’t bring the dogs into their homes, even during the dark and frigid winters. The dogs remain chained outside. Huskies, known for their strength and endurance, are used to pull sleds across the snow and ice. They eat meat and fish provided by their owners. Looks like the pair above are fervidly eyeing the day’s buffet. I visited Itilleq during the summer, when most of the snow and ice had melted. So there isn’t much for Greenland’s beautiful dogs to do during this time of year other than relax, munch on some fish, and in the rare instance in which a tourist comes along — pose for pictures.